Walk to downtown restaurants and shops! 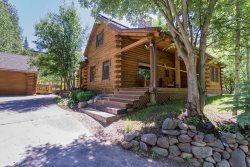 Completely remodeled in 2016, this Gorgeous Ketchum 3 BR / 2.5 Bath Log Home with A/C is a a beautiful mix of modern comforts and amenities nestled in the rustic charm of a Log Home with Wood Burning Fireplace and Mountain Views. Downtown Ketchum restaurants and shops are a mere 5 minute walk from the home while the River Run Ski Lifts and Big Wood River are less than a mile or 5 minute drive. LIVING AREA: Filled with natural light, the living area features Cathedral Ceilings, Flat Screen TV, and a Wood Burning Fireplace with Gas Starter. Leather couches- centered around the Fireplace and TV- comfortably seats 6. GOURMET KITCHEN: The small gourmet kitchen with open shelving features a Wolf 4-burner Gas Range, K-cup Coffee Maker, Stainless Steel appliances and back splash. Granite Counter Bar Seating for 3 is a great spot for a quick snack. DINING AREA: Adjacent to the Kitchen, the Dining Area easily seats 6 with built-in leather seating wrapped around the dining table. BR 1- Master King Suite: Located on the main floor, the master suite features a King Bed, Flat Screen TV, and En Suite Bath with Steam Shower.